BRAD Hardman’s next fight is getting boxing included in the Paralympics, after the Newtown resident returned to the ring last Friday night. Missing half of his left leg, Hardman lost to an able-bodied opponent during a fight night at the University of NSW. Now 31, it was his first competitive fight since being involved in a car accident as a 15-year-old. Hardman was a promising Penrith Panthers junior with a 14-2 amateur boxing record before the accident. Now trained by the legendary Johnny Lewis, Hardman has returned to the ring. ‘‘Boxing has been in the Olympics since it started, so why not the Paralympics?,’’ he said. SUNSHINE Coast pro Sarah Jane Smith's solid summer has turned white hot, with a nine-under opening round at the Women's Victorian Open leaving her atop the leaderboard. Coming off a 15th place at the Australian Open and fifth place at the New Zealand Open, US-based Smith made seven birdies and an eagle in an unblemished round of 65 at Barwon Head's Beach Golf Links. She leads fellow Australian Kristie Smith by a stroke, with Sarah Jane Smith's playing partner, England's Laura Davies, third on seven under after a 67. "Every week it's sort of been getting slowly better and better, so it's nice to have a good round here," Smith said. "I felt really nice out there. Obviously, it's pretty calm out there in the morning, so you've got to take advantage of that." Starting on the 10th, Smith moved to two under after back-to-back birdies on the par-four 13th and 14th, before turning at four under after birdies on the par-five 17th and 18th. She found another gear with an eagle on the par-five second and then made a good round great with birdies on holes four, five and seven. If Smith wins this tournament, it will be a fitting end to a summer that has enhanced her belief her game is headed in the right direction. Since teaming with American swing coach Tony Ziegler last April, the 28-year-old believes her game has steadily improved. She returns to the US after the Victoria Open and will have two weeks of practice with Ziegler before contesting her first LPGA event of the year next month. The world No.133 played 17 events and made 13 cuts in the US last year. She matched her best-ever finish with an equal sixth place at the Navistar LPGA Classic last September and had a career-best two top-10 finishes for the season. She earned $147,633 for the year to finish 67th on the money list and take her career earnings to $465,502. MEGA AUSTRALIA, the UPF 50+ sun safe sports clothing brand, is delighted to announce it has become an official sponsor of Sarah Jane Smith, one of Australia's most exciting female golfers playing on the LPGA tour. Sarah Jane, 28, is currently ranked fifth in Australia and 144 in the world. She finished sixth at the US LPGA Tour event in Alabama in September, and fifth at the New Zealand Open last week. Brought up in Caloundra, on Queensland's Sunshine Coast, Sarah Jane now lives in Orlando, Florida with husband and caddy, Duane Smith. Coached by American Tony Ziegler, Sarah Jane is currently home in Australia to compete in this week's ISPS Handa Women's Australian Open at Royal Canberra Golf Club. One of only a handful of Australians golfers currently playing the LPGA tour, Sarah says she is delighted to join forces with MEGA Australia. Simon Beck, MEGA Australia's Business Development Executive, called Sarah Jane an invaluable addition to the MEGA brand. MEGA AUSTRALIA's clothing was recently certified by the Australian Radiation Protective and Nuclear Safety Agency as UPF 50+ safe. This is the highest protection against the sun's harmful UV rays. Other MEGA Australia ambassadors include Geoff Nicholas, eight times world golf amputee champion, and amputee boxer Brad Hardman. Below is a brief clip of inspirational ambassador Brad Hardman. Brad is trained by Johnny Lewis and is seen here having a sparring session with his training partner. Whatever your passion MEGA your fashion !! MEGA Australia is proud to congratulate one of our Ambassador David Randal winning The Lakes Championship for 2012.
by leading independent German company, TÜVRheinland. Both its mens and women's summer and winter ranges have an ultraviolet protection factor (UPF) of 50+. It is the highest UPF rating available for clothing and ensures excellent protection against the damaging Aussie sun. Made from cool cotton and microfibres, MEGA AUSTRALIA clothes have a light, barely there feel. With a unique compression stretch and fast drying absorption, they offer maximum comfort and support during exercise. Designed in Japan, where it is a market leader, MEGA AUSTRALIA sportswear comes in a variety of colours and styles including t-shirts, polo shirts, jogging pants and turtle necks. Alex Katholos is golfing great! 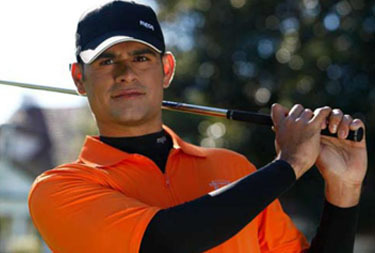 [Auguest 2012] Some sports companies allude to the protective UV qualities of their clothing but offer little validation. MEGA AUSTRALIA designs lightweight, fashionable sports clothing for men and women that is 98% UV radiation resistant. And we have the certificate to prove it. Available online and at selected retail outlets, MEGA AUSTRALIA clothing is tested by leading independent German company, TÜVRheinland. It's summer range is rated with an ultraviolet protection factor (UPF) rating of 50+; the highest level of protection available against the sun's damaging rays. MEGA AUSTRALIA clothing is made from 100% cotton microfibres. With a light, barely there feel, both the winter and summer ranges which consists of attractive t-shirts, polo shirts, jogging pants, turtle necks, have fast drying absorption qualities, and a unique compression stretch for maximum comfort and support during exercise. Designed in Japan, where it is a market leader MEGA AUSTRALIA sportswear comes in a variety of styles and colours for men and women. Geoff Nicholas, 12 times World Amputee Golf Champion, and a MEGA AUSTRALIA ambassador, says the clothing is well suited to golfers, runners and cyclists as well as other sports lovers more adept working out in the gym, boxing ring or yoga class.